There is a seemingly endless supply of apps available for today's popular tablet platforms. In these pages, we have selected some of the best tablet apps for business, productivity, and travel. You'll find a mix of apps that are new or have been recently updated and apps that have stood the test of time and received high ratings from users. Described as a "Wi-Fi flash drive with [a] simple unique user interface," AirDisk Pro (Rel. Sept. 23, 2012) is a file transfer app for sharing between your Apple mobile devices, Mac, and PC. Conveniently, you don't have to sign up for an account, but you'll need to download AirDisk Pro on all of your mobile devices to share files via Wi-Fi or Bluetooth. And when your Mac/PC and mobile device are con­nected to the same wireless network, you'll use the provided IP address (for browser or FTP client) to access the mobile files saved in AirDisk. In-app features are robust and include a document/image viewer, PDF reader, music player, text editor, folder man­ager, and passcode lock. One calendar view is never enough for the highly organized mobile user. Fortunately, CalenGoo (Rel. Oct. 17, 2012) from Dominique Andre Gunia caters to agenda-driven Android owners. Syncing your Android cal­endar and Google Calendar, CalenGoo provides five display options: day view, week view, month view, land­scape day view (actually a full week), and agenda view (listed events). There's no lack of customization op­tions either. You'll be able to set recur­ring events, invite people to events via email, add multiple reminders, and activate an optional task list. To further personalize your calendars, add Event Flair icons to calendars synced with Google Calendar. Sure, you can snap a photo of a paper document or note with your tablet's rear camera, but it won't look professional for business use. CamScanner (Rel. 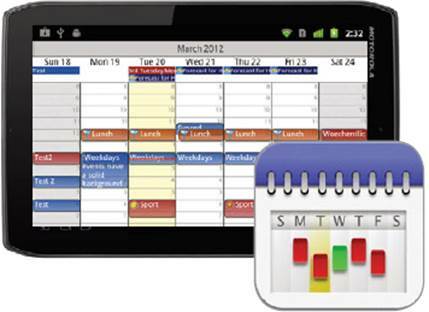 Oct. 16, 2012) from INTSIG Information lets you edit, manage, and share the mate­rials you scan. 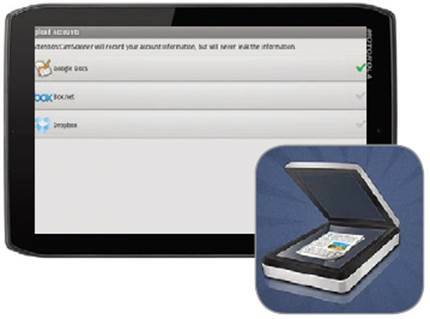 In simple terms, the app transforms your tablet into a mobile scanner and digital fax machine. After you scan an image, you can crop its edges and enhance its colors before you bind together multiple scanned docu­ments. CamScanner also lets you create new PDFs, tag individual docs, as well as merge, search, and move files. You can then fax, email, print (via Google Cloud Print), or store the final product in your onboard image gallery or one of several cloud storage services. For what you pay to download Ascendo's DataVault Password Manager (Rel. Oct. 12, 2012), you're getting your money's worth because you can run a single copy of the app on five iOS devices. Not only can you securely store all of your logins and passcodes using DataVault, but you can also back them up to the cloud. 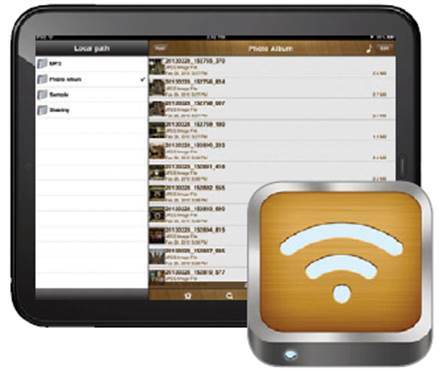 Plus, DataVault automatically updates iCloud Sync across other devices that run the app. Additional security features include AES encryption, a strong password generator, security timeout (due to inactivity), master pass­word hinting, encrypted email options, and failed login alerts. German developer Andreas Sommer offers a basic mobile tool that can be useful to the CRM-savvy business traveler who appreciates the convenience of tablet-based note-taking. Work or travel reports don't have to consist of haphazardly typed notes and a pile of receipts; instead you can use iNotes CRM (Rel. Nov. 12, 2012) to track important data such as hours worked, expenses, signatures, audio recordings, photographs, and other documents. iNotes CRM also gives you the tools to manage your customer contacts. You can prepare contact entries as PDFs for printing or email them in HTML format. Ideal for "business administrators, sales people, managers, and business owners," Inventory Tracker (Rel. Oct. 20, 2012) from Frank Android Software is a convenient app for keeping tabs on not only your inven­tory, but also sales, payments, ship­ments, and balance sheets. The app stores multiple categories, companies, locations, suppliers, clients, and more. And, if you need assistance keeping all of this organized for later review, Inventory Tracker provides filters, charts, diagrams, and sorting options. Further, you can offload backups and restore from an SD card, a select cloud service provider, or email and export or send reports as CSV or HTML files.